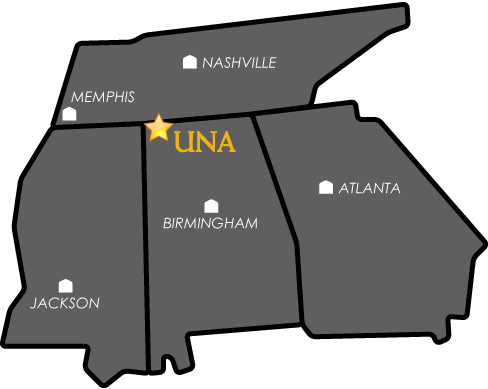 UNA ITS hosted on-campus training in the days leading up to the installation of the current phone system. If you were unable to attend training, check out the Mitel Phone System Training audio recording. The following guides include Quick Reference Guides as well as full User Guides for each of the different model phones that will be installed on campus. The model number of your new campus phone will be printed above the right corner of the phone's display. The MiCollab Client provides a single access point for all your business communication and collaboration needs. From the client, you can check the availability of colleagues, make phone calls, search the corporate directory, IM contacts, check your UNA voice mail, change status, and more, directly from your UNA desktop or laptop. Windows users - ITS will be deploying the client over the next couple weeks. Mac users - Download the client from the Mac App Store: MiCollab for Mac. What do I need to dial to get an outside line? Nothing. With the VoIP phone system, you simply dial the number as you would with any other phone. For local calls, dial (###) ###-#### and for long distance calls, dial 1 + (###) ###-####. What is the difference between an Attended Transfer and a Blind Transfer? In an Attended transfer, the party transferring the call waits on the person at the destination number to answer and then states the nature of the call. In a Blind transfer, the call is transferred without first connecting with the destination number. How do I answer another user’s phone from my own? To answer another user's phone from your own, press *6 and enter their 4-digit extension. How do I set up my phone to forward after a certain number of rings? This is no longer an option on the new phone system. You'll need to set up the phone to either forward immediately or not at all. Yes. You can check your voicemail from any phone whether it’s on campus or off campus. What is the best way to contact VoIP support? The University operates its own telephone system. The university exchange is 256-765-4100. Each campus telephone has a four-digit number, as listed in the University Directory, and calls within the campus are made by dialing the four numbers.